Healthy and strong pelvic floor muscles are critical for the optimal function of the bladder, bowel, pelvis and lower back in women of all ages. 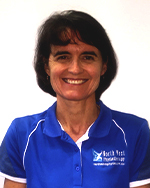 At North West Physiotherapy Maree Sweetman is trained in the assessment and treatment of the pelvic floor muscles and an individualised treatment plan is created for each patient. Electrical stimulation of very weak muscles is sometimes needed. North West Physiotherapy has the Pericalm Stimulator Unit available for hire or purchase to aid in muscle strengthening. Real Time ultrasound imaging of pelvic floor muscles is non-invasive and gives helpful patient ‘feedback’ in muscle assessment and retraining. This service is offered at North West Physiotherapy. Maree Sweetman is available for appointments on Tuesdays and Fridays.